It’s Queen Titania and King Oberon’s 1000th jubilee, and the seven Party Fairies are in charge of making the celebrations extra-special! But naughty Jack Frost has decided to sabotage the celebrations by hosting his own party – and to make his party bigger and better, he’s sent his naughty goblins to steal the Party Fairies’ magic party bags. If he succeeds, the celebrations in Fairyland will be ruined! Can Rachel, Kirsty and seven glittery fairies save the day? My favourite is jasmine the present fairy. 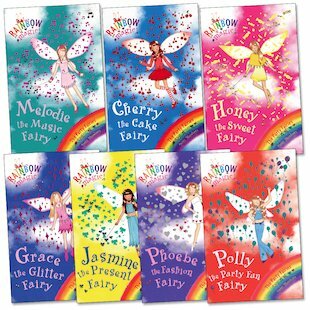 The Party Fairies are probably my most favourite Rainbow Magic fairies! This 7 book pack follows the 7 Party Fairies and of course, Rachel and Kirsty as they battle against Jack Frost. The ultimate birthday present! I read these books when I was younger I enjoyed them a bit but they were and are really repetitive but I love all the illustrations of the fairies they at drawn like they are fashionable and magical girls.